2 VIP passes to Jekyll Island, including the Georgia Sea Turtle Center, Jekyll Island Museum Tram Tour, all day bike rental, 18-hole round of golf, and more! Although the lobby was hard to find for the King and Prince, as we did arrive at night, once we walked it, it was a beautiful sight. The ceilings were high and the atmosphere exuded elegance. 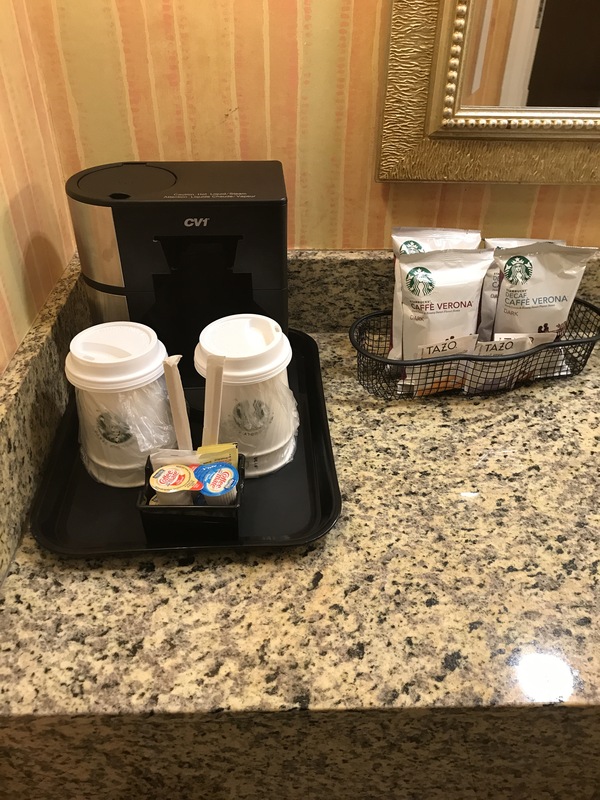 Complimentary breakfast is not included, so that was a bit of a downside for us; but they do have complimentary coffee starting from around 6:45-7:00am. Here you’ll have access to the resort’s restaurant: Echo, and you’ll also find the bar. You can access the at least one pool through here as well. 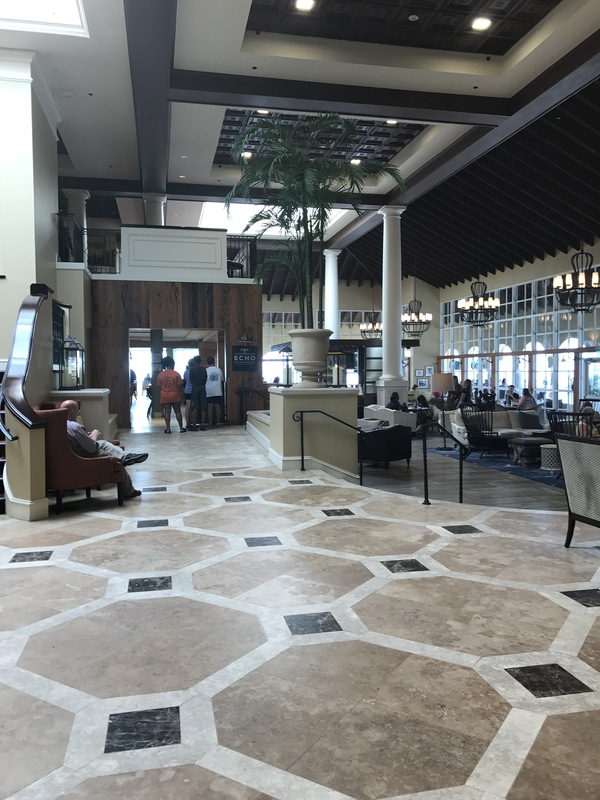 Sometimes when they hold events at the resort, it will most likely be held in the lobby area, or in one of the various rooms they have available. We stayed in the Oleander building during our time at the King and Prince, and we had our own parking lot. We were told to make sure to park in our assigned spot, which would correspond with our room number; however, we did not see any numbers on the parking spots. So we just parked wherever there was an open spot. There didn’t seem to be a problem with that method. You will be given a parking pass to put on the dash of you car every time you’re parking on the premises. I can’t say how strictly this was enforced, but one night we forgot to put it on the dash. We woke up in the middle of the night questioning if it was on there, and I ran down to check so we could have a peace of mind. We stayed on the second floor, and had a partial ocean view room with a king size bed. 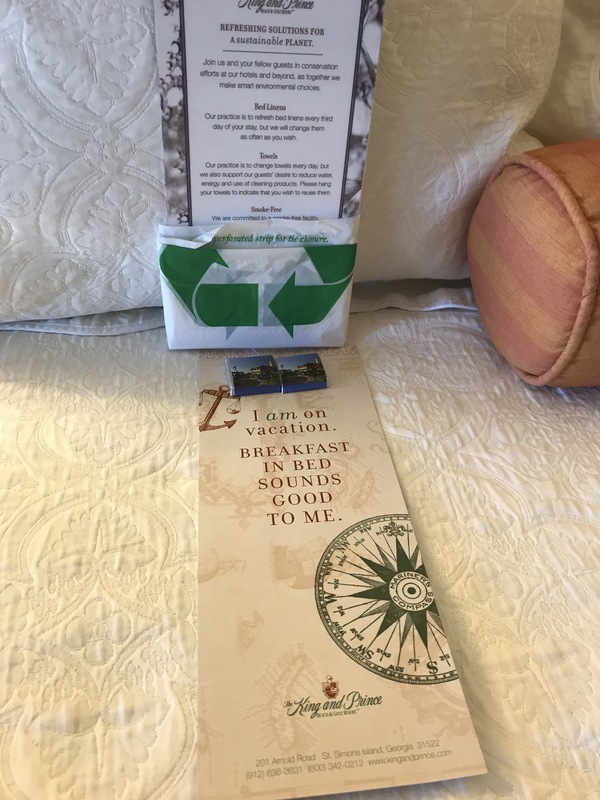 When we walked into the room, we had two pieces of chocolate, a room service card, and a friendly reminder of conserving water waiting for us on the bed. We then checked out the bathroom area, which is larger than most hotels. For the sake of pictures, I separated them out into three parts; however, I would really consider them just two. 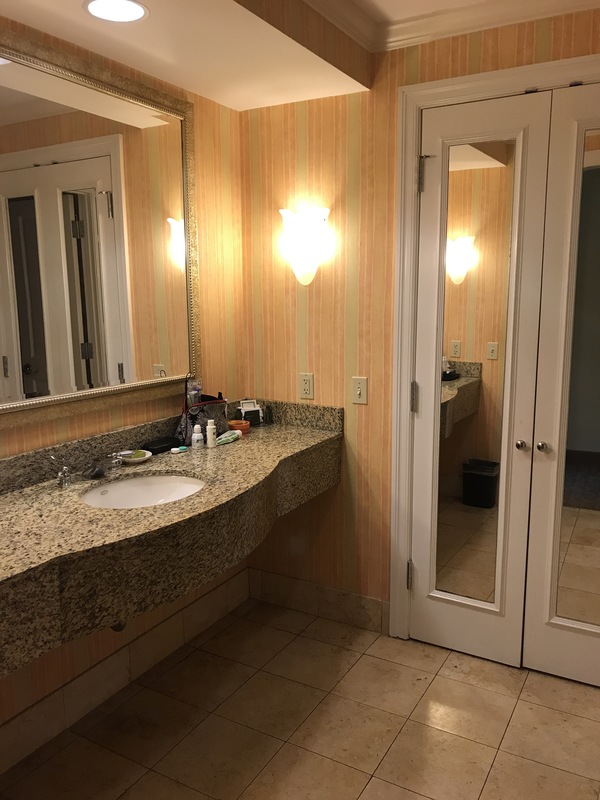 Part one consists of the larger bathroom area, which includes a large counter that has coffee and tea, and a sink, as well as a closet that doubles as a full-length mirror. In the closet, you’ll find an iron, an ironing board, a safe to keep valuables, and hangers should you need or want to hang up your clothes! 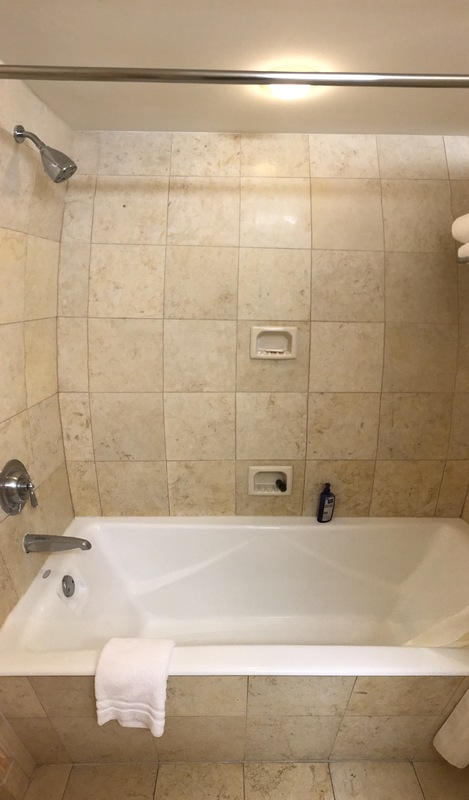 Part two consists of the actual bathroom, which has another sink [super convenient], the toilet, and the shower/tub. We found the towels to be plentiful, and it also comes with the mini shampoo, conditioner, and lotion bottles. Shower caps and makeup remover wipes can also be found! 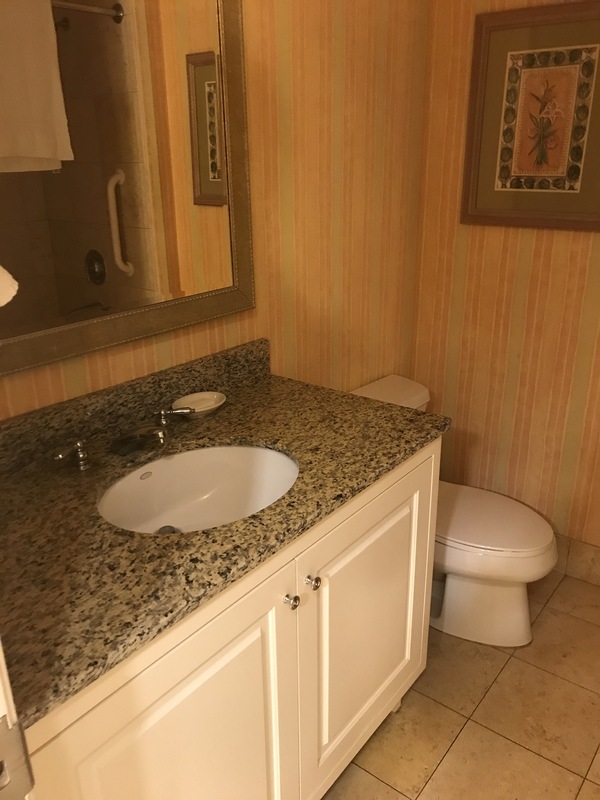 In the room, there was also have a desk where all the necessary information pertaining to the resort was contained in a binder, and the option of utilizing the desk for homework or business needs is obviously available. Or, if you’re looking for a third option, dedicate the desk area as your stockpile for snacks, like we did! 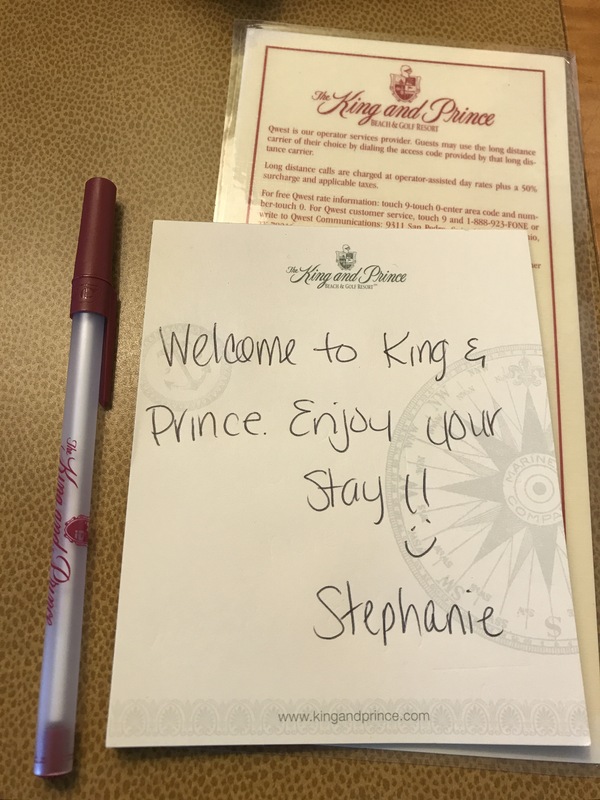 Overall, we were pleased with the service at the King and Prince. We especially enjoyed Josh, who was the individual manning the front desk when we checked in, and checked out. He was super nice and helpful, and answered all the questions I had in a very polite manner. During check out, we also interacted with Veronika, and she was amazing as well – super sweet, nice, and helpful! We also engaged with many different employees while we were there, and they would always check to see how we were doing, or hold the door open for us, or just send a friendly smile our way. We did however interact with one individual who rubbed me the wrong way. Our first morning, we decided to try the restaurant in the hotel, Echo, for breakfast. The hostess was nice enough, giving us the option to sit indoors or out. We chose out, and then we were shortly introduced to our waiter, Chris. At first, Chris seemed nice enough – when he took our drink orders, then our food orders. But after that, it started going downhill. I noticed the way he interacted with us vs the other guests he was serving. I didn’t take it to heart though, because I like giving people the benefit of the doubt. I thought maybe these guests were regulars, and they knew each other. When he brought out our food, he didn’t bring everything out that it came with [we both ordered omelettes, which came with potatoes & mini parfaits]. I thought maybe the mini parfait came out separately. But at this point, another party had come and ordered, and one of them ordered the omelette as well. Their plate came out with the parfait. When I brought it to his attention, his response was, “It should have come out with it,” as if he wasn’t the one who brought it out to us. So then he goes back in and brings out one parfait, and places the spoon down directly on the outdoor table. I again call his attention and inform him that we both ordered omelettes, so we both should get a parfait. At this point, his attitude and demeanor is leaving such a bad taste in my mouth that I didn’t even want the parfait. But I still ate it. It wasn’t the parfait that was a big deal, so much as the way we were being treated. Safe to say, I was not thrilled with his service AT ALL. It actually deterred us from going back to Echo anymore during our entire trip, although we found out from the festival, they have amazing food options. 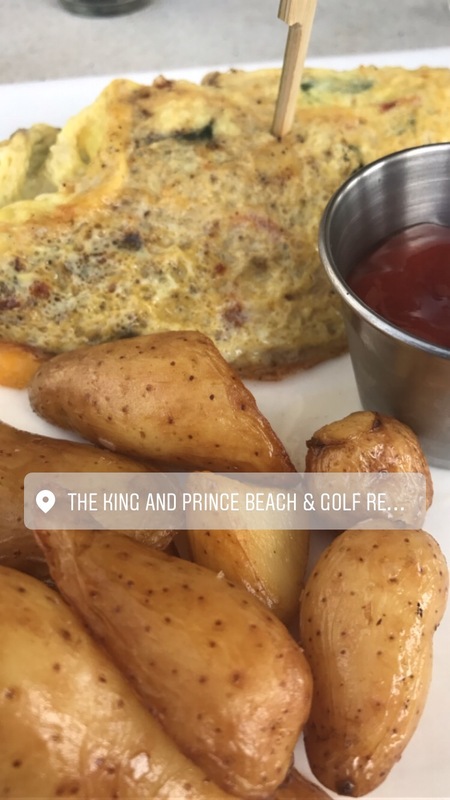 Overall, I would recommend the King and Prince Resort for those looking for a nice beach and/or golf getaway. The rooms are spacious and comfortable; the service is for the most part excellent; and the experience can be an adventure for sure. 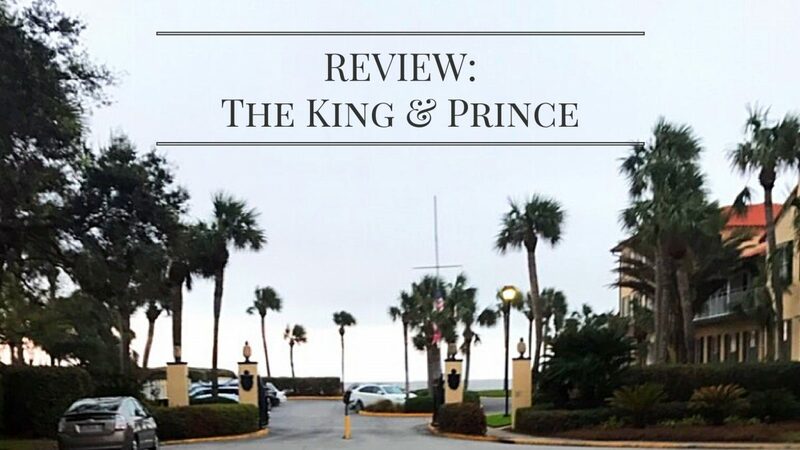 I didn’t like that there wasn’t complimentary breakfast included, and I also wasn’t a fan that the lobby wasn’t clearly marked, as the King and Prince resort consists of several different buildings. But we did really enjoy ourselves and we took advantage of the proximity of the beach! They also have a fitness room, tennis court, and several pools to use should you want to. If you’re interested in checking the place out for yourself, head over to their site and see if it’s the resort for you! Thank you! And enter contests! You never know if you might win! Wow…this looks like a beautiful place to stay! Thanks for sharing! Thanks for reading! It was a beautiful place! Congratulations! I’m glad you were able to enjoy yourself at such a beautiful resort! It looks like it was a great trip! Thank you! I definitely had an amazing trip overall! I’m gonna have to check this place out some day! Seems super nice. It is a really nice place! And for an even nicer stay, splurge for an ocean front view. That would have been incredible, but I’m not complaining! Ocean views are the best, I always try to get the best view when in a hotel. I’ve found myself saying “we wont spend that much time in the room” but it changes everything! Wow, that awesome! I’ve never won a contest but staying in a room like that would be amazing. So glad you enjoyed yourself! Thank you! And I’m still in shock that I did win! Oh I never win anything- congrats! It looks like you had a nice time to relax a bit! I do prefer when resorts have breakfast included. It looked like a decent enough place for a family or weekend getaway. Thank you for sharing your honest thoughts. Wow what a hotel. This summer we stayed in DC. It was horrible. This looks relaxing. I’m jealous. For the most part, yes! I know! I’m still in shock! But yes, the breakfast situation wasn’t enough to impact my overall experience! This sounds like a really nice place. I hope you guys had a great time! I enjoyed your post.. you gave such informative details! I found this review easy to read and follow. That totally stinks your restaurant service was so crummy. Situations like that can definitely ruin a visit. Glad to hear you met some other great people! Congrats on such a fun win! This looks like a great place to stay. I am so happy for you that you won this. I wold love to see the Sea Turtle Center. Thank you!! And you should definitely go!! My mom wasn’t a really big fan of turtles before this trip, but the Sea Turtle Center was her favorite part! Wow what a beautiful place, the room look amazing. My family and I went to a vacation just few days ago , and I was very surprised that our room didn’t include free breakfast. But it was fun though cause the kids had so much fun during their fall break . 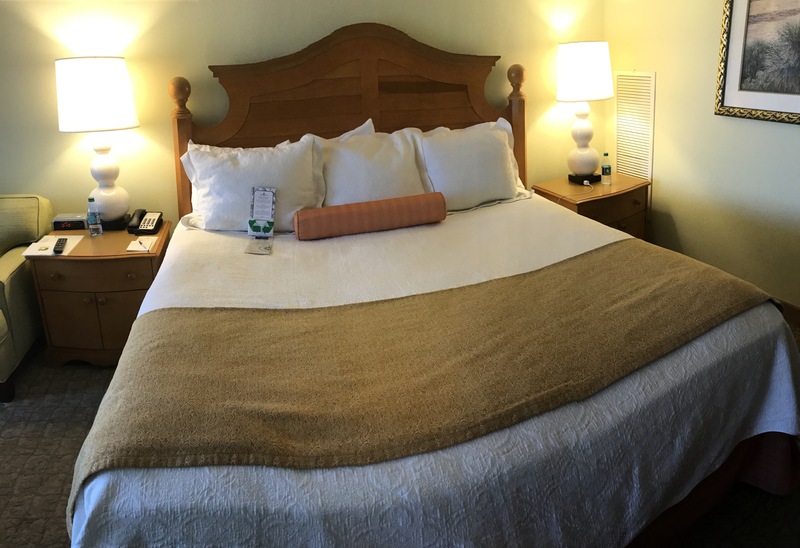 The room was very spacious and relaxing! The only thing that would make it better would be more time to spend there 😊 and I totally get it. It throws everything off balance when breakfast isn’t included – at least for my family. But I’m so happy to hear you all had a great time! This looks FABULOUS! Glad you had a great time! and HOW AWESOME to win it!! Thank you so much! I’m still in disbelief that I actually won!! This resort looks fancy! I dont mind being there all now. Thanks for this lovely post! Glad you had a great time! Thank you! And I wouldn’t mind going back! What an amazing thing to win! Looks like you had a great time. Thanks for the review! I loved the detail and all the pics you provided. The handwritten note and chocolates are nice personal touches. You certainly deserve one! Life can get pretty stressful. Don’t forget to treat yo self! WOW congrats on winning this contest! What an amazing prize to win! Interesting review of the resort – I’ve never heard of it and had to look it up. Too bad you didn’t get complimentary breakfast though – were you able to find places to eat outside of the hotel? Thank you! I had never heard of this resort before winning either – and I’d even been to St. Simon’s a couple of years back! We ended up stopping by a grocery store and grabbing a couple of things we could for breakfast in our room instead. Definitely saved us some money there! Wow! I hope you have a great stay when you go! 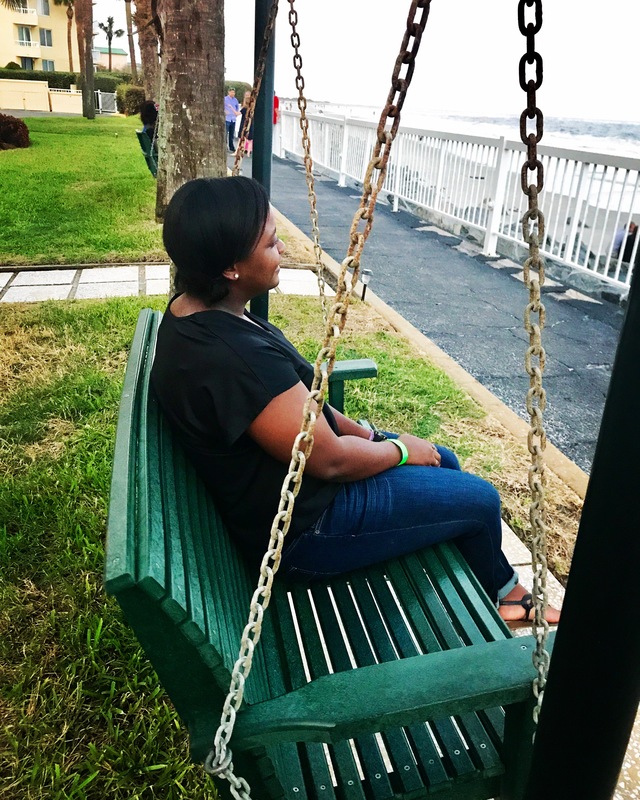 Previous Previous post: Feature Friday: Meet Carolina N.
Next Next post: Feature Friday: Meet Welile V.